Everybody Gets Some in Everybody Wants Some!! My 17 year old sister gasped when Everybody Wants Some!! ended. Not because it ends on a cliffhanger (spoiler alert: the movie is the opposite of high stakes), but simply because it was over, like when you’re a kid playing at a party and your mom randomly yells down the stairs that it’s time to go home. Not much really happens, but this movie is so fun, you don’t want it to end. I was born in 1993, my sister in 1999, and this movie was set in 1980- but it couldn’t be more relatable. Maybe it’s because I’m less than a year out of college, still riding on the high of all the memories Time Hop has to offer, but I knew these kids. You’re rolling your eyes at them one minute and wanting to join in the games the next. And it is all games, considering the movie takes place in the few days before classes and responsibilities start. College stories aren’t known for being groundbreaking, but this one just catches the feeling of being in a new place, trying to figure out where you fit in. There’s something to be said about a movie that kind of makes you wonder where you belong in the world and then disguises that feeling under a montage of athletes disco dancing. Freshman pitcher Jake calls the events of the plot “fuckwithery” and sure, that’s not a word, but you’re nodding along with them. It’s something you want to experience. Going to an 11 PM, opening night showing of a movie that isn’t Harry Potter is an experience of it’s own- in our showing, there was just me, my little sister, a dad and his high school-aged son, and three bro’s sitting in the back. It couldn’t be more clear that everyone had different reasons for seeing the movie. My sister’s were cast members Blake Jenner (known for being catfished on Glee and delivering the line “Yeah yeah, it’s a Stevie Wonder week”), Tyler Hoechlin (known for never smiling on Teen Wolf) and Glen Powell (known for saving every scene on Scream Queens). I’m sure the dad was just there to relive the glory days. Maybe the boys were baseball fans or film students. Demographic differences aside, it’s to be noted that everyone in the theater cracked up at completely different parts of the movie (weirdly, the dad didn’t react to Tyler Hoechlin wearing a crop top like my sister did). But there was the fact that everyone was laughing and enjoying themselves by the end. There’s something for everyone in this movie, and it might not be what you expect, but you’re gonna want some. ‘What If’ RomCom’s Weren’t All That Bad? If there’s one thing I can remember about being 15 it’s that I became obsessed with romantic comedies. I’m sure I’m not alone in this; it’s like suddenly the thought of buying a PG-13 movie ticket on your own is the single coolest thing to happen, and almost everyone just assumes they’ll be getting a significant other in high school so romcom’s are kind of like a practice-run into relationships, right? What I didn’t remember, and what took my own 15 year-old sister asking for recommendations to make me realize, is that a large amount of romcom’s are not all that great. This isn’t breaking news; people have always been largely unimpressed with the ‘chick flick’ genre (are you as surprised as me to remember Ryan Gosling got a Golden Globe nod for Crazy Stupid Love?). But as a person who has seen (and loved) a lot of romcom’s, it’s depressing that a lot of the most recent movies are incredibly forgettable and so cliche I wonder why I haven’t written and produced one yet. If you just take them for what they are- cute, funny, harmless- romcom’s are great, but now they’ve just gotten a bad rap for people who are watching them over the age of 17 (and the amount of times I’ve said the word “romcom” is furthering this point). The last romantic comedy I saw in theaters was the guy-oriented That Awkward Moment (which hurt my brain so much I wished I was watching High School Musical 4 instead), so when my sister begged me to take her to see What If, starring Daniel Radcliffe and Zoe Kazan, I was sort of expecting the worst. I originally thought it would just be another movie with “darn, I’ve been friend-zoned” undertones, though with Radcliffe involved I should have known better. I’m a huge Harry Potter fan, and I was really interested in seeing him do a completely different role, knowing he would probably be hilarious considering how well he did on Broadway in How to Succeed in Business Without Really Trying. So I take back what I originally said- I was expecting the worst, but also just really wanted to see Daniel Radcliffe in a romcom. And I ended up being pleasantly surprised. What If was a fresher look at friendships between men and women. The characters were great; Radcliffe is really charming and Kazan was incredibly sweet and sympathetic. As their best friends, Adam Driver and Mackenzie Davis were hilarious (Davis also starred in That Awkward Moment so it was nice to see her here), and Megan Park of The Secret Life of the American Teenager was perfectly cast as Kazan’s crazier sister. Parts of the script admittedly threw me for a loop; in one scene, Kazan’s Chantry gives Radcliffe’s Wallace her number on a sheet of paper and it just might have been so Wallace could dramatically let it fly away in the wind, but it would have felt more appropriate in a movie set a few years back? You will probably guess the ending to this movie, but before you get there there’s a unique script, interesting characters, a couple of twists and moments of real awkwardness and relatable tension. The movie didn’t try to push any agendas, just pose the real question of whether or not you should take a chance on something as life-changing and difficult as love. What If was humorous and well-acted, and not in the same league of movies as say, Failure to Launch, except that it is. Maybe all it takes is a few more well-done movies before people can stop knocking the genre for what it is. Granted, first we actually need a few more well-done movies, but What If gave me hope in a world where people think the upcoming romcom’s are going to involve people going on Tinder dates. The day that happens is the day I give up completely and go back to John Hughes. Divergent, the latest in dystopian-teen-literature-turned-film-franchise, opened this weekend, and while it’s no Catching Fire, I would highly recommend seeing it and taking every young (and old) girl and boy you know. 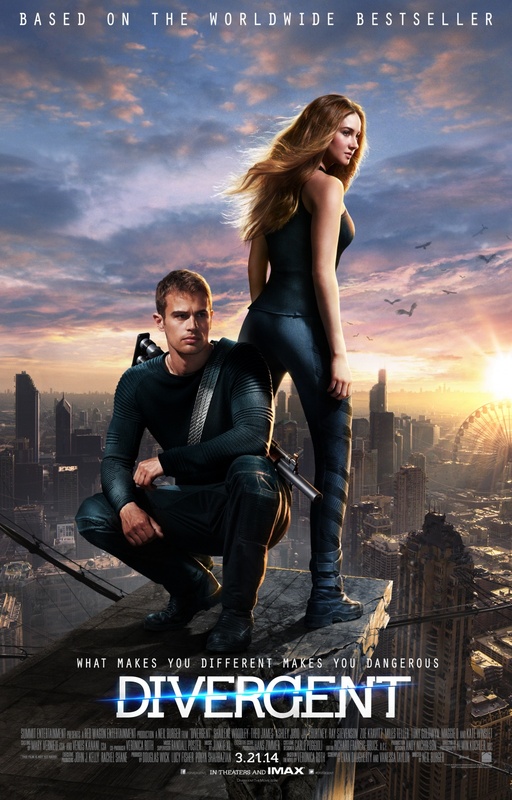 Set in an ambiguous future where people are separated into factions based on traits (honesty, selflessness, bravery, knowledge and kindness), Divergent focuses on 16 year old Tris, who’s inability to fit into one single faction makes her a threat to the government. Constantly compared to The Hunger Games series, it’s undeniable that the two share a lot in common, probably making a lot of people want to skip out on the Divergent craze entirely. But trust me, if you see the movie and aren’t struck by the intense fight scenes, Shailene Woodley’s performance, or Theo James’ face, you will remember one small but very important scene that I think everyone should see. Tris, who chooses to join the “brave” faction known as Dauntless, has to pass a series of tests in order to complete initiation and join the Dauntless for life. Without giving too much away, one of these tests involves taking a serum that forces you to combat your fears, and allows the people around you to look inside your mind. Tris’ more insignificant fears involve being attacked by birds and being trapped in a glass case filled with water. But her deepest fear is of intimacy with her new boyfriend Four. Though Four and Tris have a good relationship in real life, she that Four will take advantage of her and force her to go too far without her consent. Under the serum, Tris manages to escape by physically fighting back, and when she awakes she is greeted with applause and Four’s acceptance. Yes, it was just a simulation, but the message is clear: Tris can defend herself against an attacker that she knows and loves, and people will be proud of her. It’s a small scene altogether, but the most important in the film, and will probably be the most important in its following two sequels. A scene like this is featured in no other film in this genre. It goes without saying that Twilight portrays nearly the exact opposite, with Bella completely helpless around Edward- maybe they were in love, but who wants a heroine who physically can’t control herself around her boyfriend? And I’m completely Team Katniss, but half of The Hunger Games features Katniss forcing herself to get close to Peeta and act out the “star crossed lovers” bit so that she gets sponsors and becomes a fan favorite. It’s a survival tactic, no doubt about it, but when you really think about it, it’s pretty gross that either of them had to experience that. Divergent is a completely new outlook on this situation. Four isn’t a hero for respecting Tris’ wishes, but is just an example for how all boys should act. It’s not revolutionary, and maybe Divergent isn’t the next huge hit, but if it should be remembered for anything, it should be for this. You can be a badass heroine, and get the guy, and still feel safe about it. It’s your choice, and it’s a choice I’m happy to see portrayed on the big screen. Well done. What’s a “Guilty Pleasure,” Anyway? Since I was a little kid, I’ve had an obsessive personality when it came to books, movies, and TV shows. Caught between my older and younger sisters, you could also say my taste was eclectic when it came to the things that my peers were paying attention to. And for some reason that is still beyond me, people have constantly used this trait as a way to taunt me. When I was little, I read too much Harry Potter. I was still watching Lizzie McGuire when everyone else graduated to Laguna Beach. In high school, it was absolutely ridiculous that I listened to the Jonas Brothers, and why in the world am I currently obsessed with One Direction? As if it was something that could infect the people around me, my “bad” tastes have been the target for teasing for as long as I can remember. As an adult, I couldn’t care less what people have to say about my interests. And though it never extensively bugged me much as a kid, it did make me feel embarrassed whenever people asked me to play my iPod or started talking about what they watched on TV the night before. Any interview I watched with a celebrity would include the question, “whats your guilty pleasure?” and for a while it felt to me like everyone was on the same page: you could like whatever you wanted if it was popular, or if it wasn’t popular you could admit that it wasn’t cool and feel bad about it, or it was cool because it wasn’t popular. Plain and simple. But if thats the case, then what is pop-culture? If everyone is going to either go along with the often-trivialized mainstream media that defines our society or hate it for everything that it is, than what is its point? Correct me if I am wrong, but aren’t movies and TV shows made for people to think, and for people to enjoy themselves? Sure, the making of films is becoming all about making money (which is an entirely different post all together), but I can’t be the only one who turns on the TV or opens up a book to at least learn something. Whether that “something” is educational, thought provoking, or just something else I’ve learned makes me laugh, it seems like it should be all about just enjoying yourself. Which brings me back to my original point. Harry Potter, apart of the mainstream pop-culture since the 90’s, is something that made me happy and made me want to read as a seven year old. Lizzie McGuire, one of Disney’s most popular shows, gave me a role model in Hilary Duff. And One Direction’s music is catchy as anything, and they’re talented, and cute. Who cares? Why has it been put in our heads that we should feel guilty for liking something that someone distributed for widespread enjoyment or education? As long as it’s not hurting anyone, and as long as any problematic issues are being acknowledged, then why should a third party be given the right to make me regret something that makes me happy? I’m not saying that I walk around forcing the people around me to dissect the Jonas Brothers break-up with me, or bring up High School Musical in job interviews. But I am saying that this whole “guilty pleasure” idea needs to stop. Stop feeling guilty about the things you like! If people take issue with the things that make you happy, then they’re probably just jealous their taste isn’t as original as yours.